Being primarily a Sports photographer, I need to have whatever gear I can think of for that particular event. Each sport brings it’s own gear requirement. I have covered the 2014 Winter Olympics in Sochi, Russia for USAToday, numerous MLB All Star Games and World Series, NFL Super Bowls, NHL Stanley Cup Finals, and Indianapolis 500’s plus St. Louis Cardinals and St. Louis Blues games, so I need to make sure that I am always prepared and have the proper gear. Most of the time I am using 3 cameras to cover an event. If I am shooting football. I will use a 180-400mm f4.0 zoom lens on a monopod, a 24-105mm f4.0 or 70-200mm f2.8 zoom lens on my right shoulder and a wide zoom around my neck, usually around a 14-24mm f4.0 zoom or a fisheye lens for extremely close plays. For baseball, it’s my Nikon 180-400mm f4.0 zoom lens on a monopod and a wide zoom nearby for dugout celebration photos. I will frequently set up a remote camera so that I can get photos from a different angle and trigger that while I am shooting with the camera in my hands, giving me 2 different viewpoints. When shooting hockey, I have a 70-200mm f2.8 zoom lens in my hands and a fisheye lens around my neck for when plays happen right in front of me. At all events, I will have one or two speedlights with me in my roller just in case I have to shoot a quick portrait, or a group photo. Since I occasionally set up remote cameras and also have my speedlights, I pack at least a couple of radio triggers. Every bag I use will also have memory cards and spare batteries. In the first photo, this is a standard setup for a baseball game. Three cameras, four lenses, two speedlights, and a monopod for my telephoto zoom lens. If I set up a remote camera, I will have an extra bag with me for the remote gear. In the second photo, this is similar to the gear that I would bring to a hockey game. 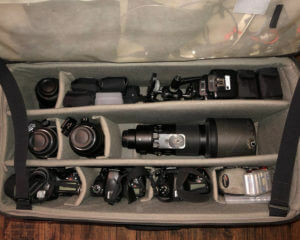 Three cameras, four to five lenses, two speedlights, and a monopod for my telephoto zoom lens. Since I frequently set up remotes at hockey, I will pack at least four radio triggers and mounting hardware (clamps, articulated arms, and safety cables). This is also a similar setup to what I would bring if I’m traveling since I’ll want to make sure I have the right gear for any situation. 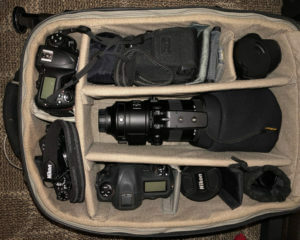 Since I am always using a lot of gear, I prefer rolling camera bags to make it easier to go from the parking lot, airport, etc. into the venue. If I am doing location work that involves a lot of walking to a destination that doesn’t have a paved surface I will bring a belt with pouches or a backpack. No matter what the sport, I always try to be as prepared as I can so that I won’t miss a shot because I left a certain piece of gear at home. June 2, 2018; St. Louis, MO, USA; during the game at Busch Stadium. May 5, 2018; St. Louis, MO, USA; during the game at Busch Stadium.